Manager Simon Grayson insists he is the "right man" to lead Sunderland out of relegation trouble in the Championship, despite an 11-match winless run. Grayson took over at the Stadium of Light in the summer, succeeding David Moyes, who left after the Black Cats' relegation from the Premier League. However, the former Preston and Leeds boss has been unable to turn their form around, winning one of 14 league games. "I've 100% confidence," Grayson, 47, told BBC Newcastle. "Am I the right man? Certainly am. I've been through things. There aren't better or experienced managers out there that would want this job, or can do a better job that what I'm doing at the moment in time." Bolton, the only side below them in the division, are Sunderland's next opponents at the Stadium of Light on Tuesday. Home form has been a major concern for Grayson, whose side have not won a game on their own turf since beating Watford as a then top-flight club in December 2016. "I can tell everyone what a great environment we're working in, a positive training ground, but results are all that matters," he added. "People will make their own minds up whether I'm the right man for the job but ultimately I've improved the club, and there's a lot of work to be done. "We're all in this together, the players and the staff, we all want the one thing and that is a victory." Simon Grayson's position could be significantly and perhaps fatally wounded if Sunderland lose against Bolton, but by the same measure his position could become a little more secure with a win. He is experienced enough to know only too well that a manager is judged by results, and one win in the last 14 has brought his tenure under scrutiny. 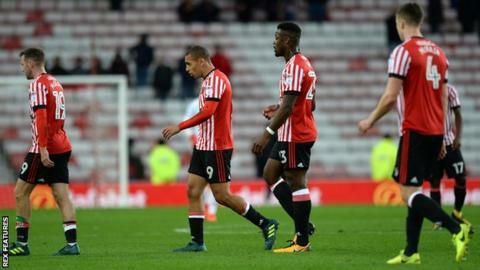 The Stadium of Light has in recent times been a graveyard for manager's reputations once they've accepted the position at Sunderland. With it being Halloween [for the Bolton game], the metaphor seems even more apt and there are plenty of people now wanting him to fail. Grayson has to firstly convince those still behind him he's the right man for the job, but it will take longer to convince the doubters and the Bolton game will test his ability to the maximum. Is the Stadium of Light the place to do that at the moment? Half full and with an atmosphere that plays into opposing sides' hands it is as tough as it gets. Of course it's a cliche to say it is a 'must win' game, but it is, and Grayson will have to have the courage of his convictions and hope the team shows a bravery that has been lacking in recent home matches.